The token, which has been airdropped to WAVES holders, will give traders a rebate on the exchange’s fees. Tidex’s goal is to build a secure, user-friendly exchange that meets all the compliance requirements of the US and EU. Despite being a relatively new exchange, user numbers and trading volumes have increased dramatically in the course of the last six months. Currently one of the top 50 exchanges, it is Tidex’s goal to become a Top 5 exchange globally. This process will involve a series of upgrades including adding fiat gateways, ensuring compliance to international standards, gaining the required licences Europe and Asia, and implementing the best practices of modern trading platforms. New tools such as margin trading and different order types will be included to attract new traders. Now celebrating a year since it was announced on bitcointalk, Tidex is launching its own token on the Waves platform to facilitate trading. Holding TDX will give users discounts on trading fees, and it will be possible to earn tokens for certain activities. As a bonus to the community, 250,000 TDX were airdropped to WAVES holders in December. Another 250,000 TDX were airdropped today. 200,000 TDX were distributed to WCT holders and another 50,000 TDX to WAVES holders. A further 500,000 will be distributed in the future. 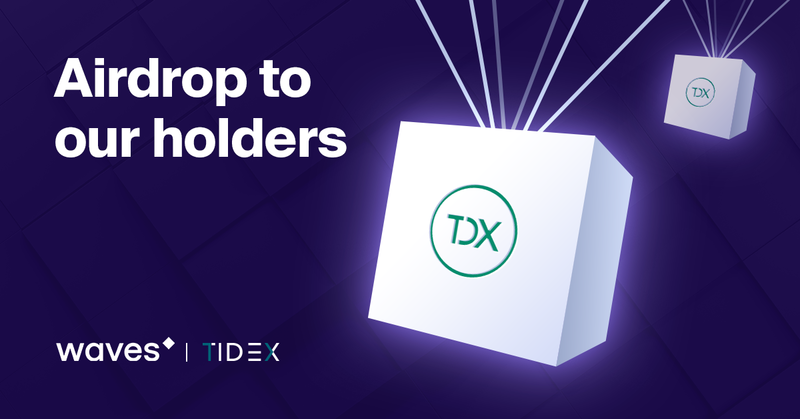 Of course, you can buy tokens from Tidex or the Waves DEX if you didn’t receive any or don’t want to wait for the next airdrop. Additionally, traders will receive tokens for bringing volume to the exchange. Daily trading volumes of more than 1 BTC will earn 25 TDX. Tidex is undergoing a process of continual improvement and development, and we hope the community will join us in making it one of the major cryptocurrency exchanges for global traders.